"Delivery was prompt and the unit was easily installed and activated. It is a big improvement—I really like the digital display. We have been in a bit of a heat wave and the unit is working perfectly." "I purchased this unit to install outside a customer’s wine room. Installation was very easy and unit is working like a charm. 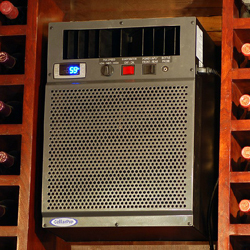 This is the second CellarPro I have installed and I would not use anything else." "I replaced a Breezaire unit that leaked water and wouldn't keep my cellar a consistent humidity and was extremely noisy. I mounted this unit in my cellar and used the rear ducting. Temperature and humidity are in the perfect range and I cannot hear it running outside of my cellar. I wish I had purchased this one first." "I bought this to replace the cooling unit that came with my Vinotemp which died after 3 years. What an improvement! This keeps the cabinet much cooler, and was so easy to install. My only regret is that I didn't buy this in the first place." "Absolutely perfect for my needs. The unit is quiet and my cellar temperature is rock-solid steady. I highly recommend the unit and the company. I wasn't sure exactly what accessories I needed, and ordered more than should have. 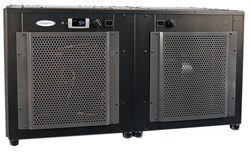 The people at Cellarpro got in touch with me immediately, asked questions about how I intended to install and use the unit, and made sure they shipped only what I needed." "Thank you for making my purchase a breeze, I really enjoyed the vast knowledge of your staff and the prompt responses for any questions I had." "I'm a general contractor who was asked to renovate a fine wine cellar. I chose this system after a visit to the factory. I saw high quality components and high value in the manufacturing process. I was given great support before the purchase and installation. Their warranty is underscored by their posture of being a collaborative team member. CellarPro has the kind of people you want to work with." "My previous two units were low-end. Thankfully, CellarPro is a major move up. It is quite robust with good temperature and humidity control. The fan control is most helpful when guests stay nearby; it can run very quietly when needed."